It is not easy to spot the Raviraj lending library on Usman Road, T Nagar, amid the many popular shops and commercial establishments. 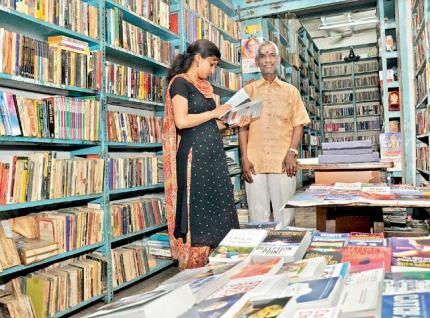 65-year-old Raviraj has been running the library for 45 years in the same place. Though shoppers are busy thronging Usman Road and Ranganathan Street, there are people who still visit the library and spend time there to read their favourite books. “It’s tough to run a lending library here. Earlier, students used to read many books but these days they prefer social networking sites and watching television,” admits Raviraj, who studied till PUC. “I used to visit Moore Market and collect books to read. Reading became my passion and I started a library in Moore Market and shifted to the present place after requests from my customers. They told me the lending library would be of great use to T. Nagar residents,” said the librarian. From 2,000 odd members in the 1970s, the library has only around 1,000 members at present with the majority of them being women. “Women, especially college girls show a lot of interest in fiction. School students hardly visit the library though we have many story books,” says Raviraj. The lending library has over 10,000 books across genres like fiction, adventure and computers. The membership fee is Rs200. “Our members prefer books by Sidney Sheldon, Jeffrey Archer, Sivashankarai and Indumathi among other authors. I manage to survive with a meager amount I earn from lending books thanks to my customers who visit my library regularly,” says Raviraj, who pays Rs750 as rent. “The shop owner has been demanding more rent and I don’t want to do any other business here. I will continue running the library in the same place,” he added.